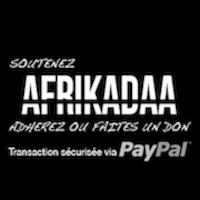 SUPAFRIK, votre pop-store/ galerie itinérant a investi la Cremerie de Paris depuis hier. Profitez du week-end pour aller découvrir les oeuvres des artistes sélectionné par SUPAFRIK et AFRIKADAA dans ce lieu chargé d'histoire. SUPAFRIK, your traveling pop-store/gallery concept have move into "La Crèmerie de Paris" since yesterday. We invite to enjoy the work of the visual artists selected by SUPAFRIK and AFRIKADAA during this week-end, in this place full of history. AFRIKADAA - Your are both based in Toronto is it the first time that your work will be exposed in Paris ? Komi : Yes. However, in 2010 I had the opportunity to perform spoken word here in Paris and Bobigny. Danilo : Yes, well at least to my knowledge. But hopefully its just the beginning. AFRIKADAA - SUPAFRIK is an event mixing fashion and visual art, do you think these two worlds are bound to evolve together in our contemporary societies? Komi : Both are forms of self expression. I think they evolve at different paces, however given the present condition of our global society the parallels between the two are manifesting more frequently. Danilo : Most definitely. The 2 worlds often overlap. In this age so many of us creatives wear several hats, and we use different mediums to express different sides of our character. Many artists decide to dabble in fashion, whether its putting their prints on clothing or fulling redesigning garments. You also have musical artists like Kanye and so many other wanting to fully engage in the fashion world and process of creation. Fashion and Art go hand in hand. Fashion in itself can be such an artistic expression. Both from the designer’s perspective and from the consumers. Its kind of impossible in my mind to keep those worlds fully exclusive. AFRIKADAA : What prompted you to take part in this event ? Komi : Well, It was the first opportunity I have had to show my work outside Canada. And the African Influence at the core of the SUPAFRIK convinced me that this a nice chance to communicate not only with Other Africans in diaspora but to also with those who are drawn to fashion. I feel Art could be very therapeutic not only for the artist but the audience, so the wider the audience the greater the possibility of someone connecting to the work. Danilo : I’ve attended Chinedu’s Supafrik events in Toronto previously and have been very impressed. I really appreciate the quality of the collection of work / artists / brands that Chinedu puts together. And I also appreciate how concept driven the Supafrik projects are. One Supafrik event I attended was a pop-up shop. I saw what the space had looked like previously, and what Chinedu and the Supafrik team did to transform the space was sincerely captivating. Supafrik founder Chinedu is a great creative mind and we share similar aesthetics, ambitions and vision around our work. So i was honored when Chinedu invited me to be apart of this collection of great artists he has taken overseas. It also aligns with the plans for my present body of work. And that is to see my work journey across the world. I call it Starships and Angels (Deluxe): Starships travel the planet. AFRIKADAA : Since a few year the interest for « Black » fashion and art have increased, what do you think about this phenomenon ? Danilo : I think that phenomenon is phenominal ! With so many high profile black artist and musicians acting as the taste-makers of the day it seems like a natural progression and i’m glad its arrived. Cause both these worlds do have an absence of people of color leading these industries, so i’m glad their is a trend like this thats increasing. AFRIKADAA Komi you have studied architecture, how did you come to painting and where do you find your inspiration? Komi : Well, of inspiration, it may sound cliche but I learned earlier on that you cannot afford to sit and wait for inpiration, you just have to do. My Prof. used to say "don't tell me, show me" so I try to live by this moto. I find it a lot easier to just start a project and allow the inspiration to meet me on the way to the finish line. However, I love books. NO matter what you are going through or trying to understand, someone has been in a similar position and written a book about it. AFRIKADAA Danilo, your work is kind of « Afrofuturistic » a theme that have been explored in our last issue, where do you draw your inspiration from? Danilo : Thank you. Yes, indeed my work is absolutely Afrofuturistic ! That is the art movement that best describes what i'm doing. For example my last exhibition was called ‘Starships and Angels’. It explores a narrative i created following these Dream Guardian characters who come to our planet in Starships to help us follow our deepest dreams. Most of the characters I paint are people of color and I love sci-fi so it happened really organically that i started creating these futuristic spacescapes with Black people inhabiting them. Fast forward and now my work is moving full speed ahead into the depths of Afrofuturism. Inspirations? I draw inspirations from so many places these days especially in this internet/smartphone age. But there are some essentials that I gotta mention. Well of course im inspired by the brilliant sci-fi writing of Octavia Butler ! She was a master mind indeed. Also writings of Nalo Hopkinson are amazing. Anime has been a big inspiration over the years. Those Japanese kats are galaxies ahead in terms of their storylines especially dealing with technology. And the subtlties in their plots are marvelous. And often balanced by intense visuals. My favourite anime dude is Miyazaki. Genius. Nuff said. I’m inspired by the ink drawings of Otomo, and pieces by Takashi Murakami. Kehinde is awesome. Nicolas DiGenova is fresh. Komi Olaf who is also in the show is doing some cool stuff right now and i’m sure its just gonna get doper. Graf art especially out their in Europe, like Paris and Berlin is inspirational. And then of course there’s the brilliant minds in my surrounding creative circle who are always blowing my mind. Audio and visuals by Chris Ak from Black Iron Giant. The daily photographic fantasmo of SoTeeOh. And my painting partner whose also studying architecture explodes my mind on the regular, my brotha Javid aka Jah. For me there is definitely no absense of inspiring energy. Inspiration is everywhere. Blessings. AFRIKADAA : SUPAFRIK is also about fashion who are your favourite designers ? Komi : I really like Alexander Mcqueen. I love watching his runway shows..so much drama. I love it. Danilo : I’m not heavy on my fashion designer game. I vibe to the whole Streetwear fashion movement. Hop on Karmaloop and you’ll get the effect. So oppose to designers it’d be certain brands. I’m also a lover of the graphic tee. And in my mind, early Echo (Unlimited), back in the 90’s still holds the title. AFRIKADAA : How would you describe your work? Danilo : My work is focused around painting Afrofuturistic Portraits. I call them Dream Guardians. Secondarily i create drawings, paintings, and murals of Starships from the Dreamworld. My work is heavily driven by dreams and the pursuit of our deepest ambitions. After testing many mediums I’ve chosen to work with Oil and Ink on wood. But really like any art you really just have to see the work. The other important subtext to my work revolves around depicting people of colour in realms of science fiction. I call it Chromaspace. It’s my expression of Afrofuturism. AFRIKADAA : Which creative medium would you love to pursue but haven’t yet? Komi : Sculpture. I feel it will be able give me an opportunity to explore some of the skills I acquired in architecture school that have been dormant for a while. Danilo : The Jewels. Lol. I do love rings, timepieces and gemstones. So perhaps one day I’ll explore the Jewelry type ish. My other creative mistress is Cinematography/Videography. AFRIKADAA : Which step is your favorite when you make an art piece ? Komi : Somewhere between the 3rd and 4th layer in a painting. When the awkward stage is over for me and the painting is beginning to take on a life of its own. At that point i find it extremely difficult to do anything else..lol..like eat for example. Danilo : The beginning conception period can be exciting. But i really love when you get to the ending touches and serious details. That’s when you say to yourself ‘Daaaaamn, now that brush stroke is really gonna kill em’ . Its when you bring the piece from great to becoming a ‘masterpiece’. Absolute satisfaction. AFRIKADAA : What are your feelings towards the contemporary art world? Danilo : Its great. Its strange. Its isolating. Its pretentious. Its too abstract. But then sometimes I wish it had more conceptual strength. In certain ways its back in the hands of the artist and the public it serves. Artists are everywhere. And so the contemporary art world is alive and well. AFRIKADAA : What does “being creative” mean to you? Komi : I think being creative is continuous process of emptying your mind and looking at the world outside and inside with new eyes. Danilo : For me being creative often means collaboration. It means hard, consistent work until your skill flows from your hand as smooth as silk. To truly be creative you must be living life in the moment. Though you have created sketches and plans, when you're really being creative you are able to let go and be inspired by what is happening in that moment and make adjustments accordingly. When you’re truly being creative the ish feels like magic. Komi : I'll be a hat. A nice embroidered cap , with some wear and tear on the inside. AFRIKADAA : If you where an art piece …. AFRIKADAA : What message would you like to deliver to our readers? Komi : Change on the outside begins from the inside. Danilo : Find a way to live your dreams in waking life.